Carissa Hernandez, MA and Saili S. Kulkarni, Ph.D.
Benjamin S. Riden Ph.D., Andrew M. Markelz Ph.D. and M. Kathleen Heid Ph.D.
Matthew Glavach, Ph.D. and Warren Pribyl, M.A. Chelsea T. Morris, Ph.D and Rachel J. Chidester, M.S. Katherine Trela, Ph.D., Wendy Gladstone-Brown, Ed.D., Norah Merritt, Ph.D. and Leah Raftis, Ed.D. Kaylee S. Wynkoop. Ph.D., Rachel E. Robertson, Ph.D., BCBA-D and Emily E. Sobeck, Ph.D. 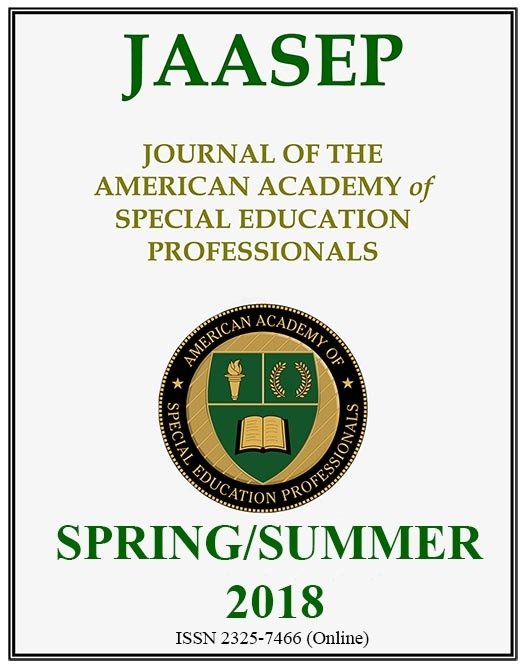 If you are NOT A MEMBER of NASET you may purchase this issue of JAASEP for $19.95 (use the Buy Now button below) or Join NASET for free access to this and all past issues of JAASEP. Joseph F Drolette, Ed.D, B.C.S.E. Russell G. Dubberly, N.B.C.T., Ed. D.
Anne Durham, MM., MS. ME. Deborah W. Hartman, M.S., B.C.S.E. Victoria W. Hulsey, Ed. D.
Cara E. McDermott Fasy NBCT, Ph.D.
Anji Reddy Nalamalapu, M.A., M.Ed. Benjamin Riden, ABD - Ph.D.
Perry A. Zirkel, Ph.D., J.D., LL.